Now its turn for Kerala's food. Kerala is known for its traditional sadhyas, a vegetarian meal served with boiled rice or Red Rice or Brown Rice and a host of side-dishes. The sadhya is complemented by payasam, a sweet milk dessert native to Kerala. The sadhya is, as per custom, served on a banana leaf. The southern Kerala dishes are often spiced with garlic, whereas in North Kerala garlic is generrally avoided in all vegetarian dishes. 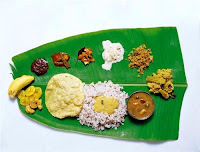 Traditional dishes include sambar, aviyal, kaalan, theeyal, thoran, injipully, pulisherry, appam , kappa (tapioca), puttu(steam cake) and puzhukku.